Gr.1 Australian Guineas-winner Ferlax (NZ) (Pentire) has sired his first winner, Rare Episode, who won as he liked on debut at Gosford yesterday with a tilt at the Karaka Million 3YO Mile a possibility. The highest priced yearling for his ill-fated sire at Karaka 2017, Rare Episode was a $100,000 purchase by Mick Malone of Kitchwin Hills for Max Whitby and Neil Werrett. He’s been handled and educated perfectly by trainer Brad Widdup, with two tidy trials under his belt as a late 2YO whilst his two trials as a 3YO showed the colt was primed for his first test. Bouncing out of the gates first, Rare Episode never relinquished the lead over the 1100m trip and ran away from the opposition for an easy four-and-a-half length win. Haunui Farm’s Mark Chitty says, “It was a real blow to lose Ferlax the week before his first crop were set to go through the sale ring at Karaka. It really did effect his results at the sales but we had two colts in our draft that we thought were six-figure colts and this guy was one of them. A Classic-winner himself, Ferlax has only 52 foals in his first crop and somewhat surprisingly was represented in the 2018 Karaka Million by the Wayne Hillis-trained filly Imelda Mary. 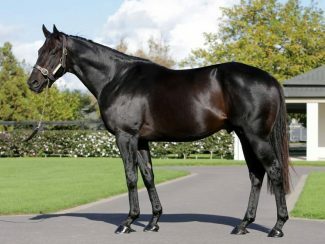 With his first crop now three and with his first winner on the board, it will come as no surprise to see further results coming his way over the coming months.